With no county-wide sales tax, should the city double down on Metro? CINCINNATI -- Should the city raise its earnings tax to support improved bus service? That's the question on Cam Hardy's mind, after the Southwest Ohio Regional Transit Authority Board of Trustees decided last week not to present voters with the option to increase the Hamilton County sales tax for improvements to Cincinnati Metro's bus service. Hardy runs the growing grassroots advocacy group, the Better Bus Coalition. He described himself as "so angry" that he needed to keep "his comments very brief" during the July 25 special meeting of the board. He wasn't alone looking at the earnings tax. 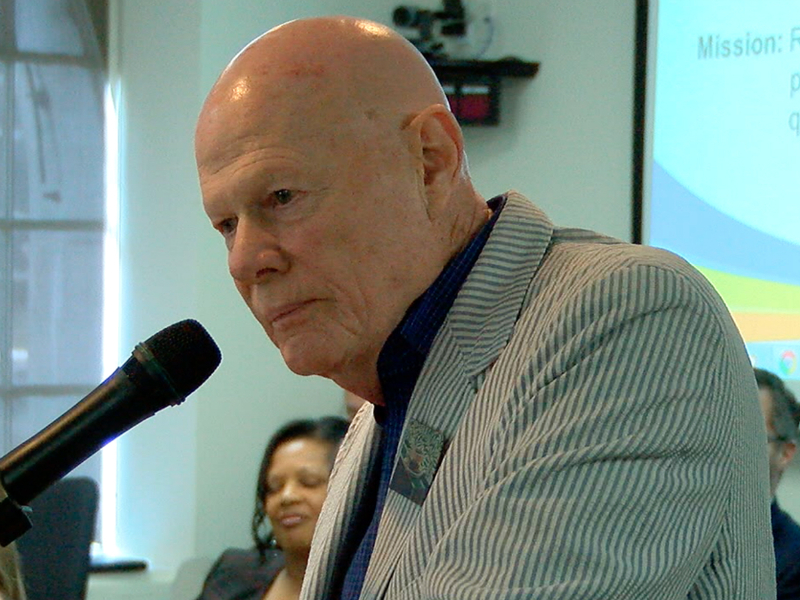 Former SORTA board member and Vice Mayor of Cincinnati Jim Tarbell originally didn't wish to address the board during its meeting last week, but after hearing the discussion, he decided it was time to say something. "Myself and others have talked about this quietly for too long," he told the SORTA board. "If what I'm hearing here today is true, if what all of you are saying is true about consensus, about team-building and cooperation, then it is time to talk about a funding measure -- especially in light of what is not going to happen -- it's time to talk about a measure that could happen." Tarbell proposed what he called a "dramatic increase" to the city's earning's tax, currently at 2.1 percent, the lowest among major cities in Ohio. Cincinnati voters haven't increased the earnings tax since 1988. "If we're explaining what we would get from it, and explaining to the public, to the voters what they would get in return from passing a dramatic increase in the earnings tax, it would pass," Tarbell said. "County-only I think is unrealistic, but city-only, especially with the support of all of you in the Tri-State behind it, it would pass," he told the board. Tarbell called the earnings tax -- 0.3 percent of which, or roughly $50 million, goes toward funding Cincinnati Metro each year -- the "backbone of the city's economy." Coming up on a $30 million-plus budget gap of its own, some City Council members pitched an earnings tax increase earlier this summer , but that was not included in next year's budget. Hardy told WCPO after the meeting that the Better Bus Coalition is developing two ballot initiative options -- one that could go before Cincinnati voters in May 2019 or later that fall. He didn't say it would necessarily raise the earnings tax, but -- if it did not increase -- at least more of it would go toward Metro. "Our plan now is to pursue a Charter amendment that raises the 0.3 (percent) to 0.5," he said. "They've been kicking this county thing around for 20 years. They have left us no choice than to go to city residents and get this approved. "I don't think it's fair to hold up bus riders another 10 years while they continue to punt this political football around." Hardy's proposal would raise an additional $32-35 million a year for Metro. And time is of the essence: As soon as January 2019, Metro faces a $6 million operations deficit, in addition to another $33 million shortfall for capital spending. That's for things like new buses -- Metro's fleet is aging rapidly -- and more staff to drive and maintain them. But even Hardy admits his plan could have consequences for bus riders living outside the city. "This is not going to be an easy thing to do," he said. "People will be impacted by this. This won't be something that benefits everybody." Hardy's plan would combine increased funding along with shrinking Metro's footprint across the region, in order to prioritize service within the city limits and at select, key job centers across Hamilton County, like Blue Ash and Sharonville. "I think that if we can shrink the footprint, pull some money back, then the city would be able to send buses to those centers," he said. But before any of that can happen, Hardy and his cohorts will need to gather more than 6,000 signatures from registered city voters to get the plan on the ballot. A recent proposal to raise the earnings tax -- as part of the Preschool Promise campaign of 2016 -- met staunch opposition from Cincinnati's business community. "We will strive toward 9,000-10,000 to be sure," he said. "This is our last ditch effort. We gave the SORTA board two years to get this done. They failed us, so now we have to take this back."